iPhone magnetic mount lenses clarify your photos: "USB Fever have a trio of lenses that adhere to your iPhone via a magnetic ring. The Wide Angle lens (pictured above) offers a .67x zoom with Super Macro. The trio of lenses provide: Wide Angle, Telephoto (2x) and Fish-Eye capabilities to the iPhone (original and 3G) as well as a slew of other phones and even computers. 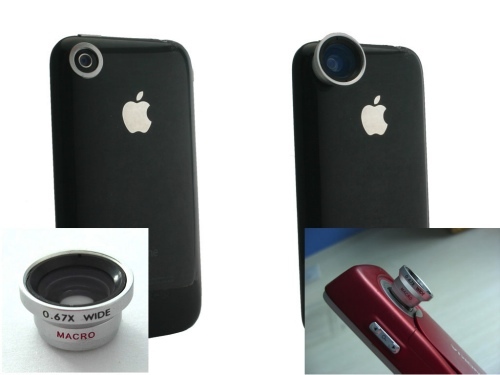 Since the iPhone 3G features a plastic base, USB Fever have a solution to magnetically mount the lenses to those phones with plastic cases"